Ta dah! You did it! Thank you! Your Board still needs a few thousand dollars to pay final legal bills. Please etransfer your donations to protectai@kos.net or send a cheque payable to “APAI” Box 6 Stella ON K0H 2S0. Windlectric Inc. a subsidiary of Algonquin Power and Liberty Utilities blanketed Amherst Island with 26 fifty storey turbines. The desecration is unimaginable. Call to Action: Please request Premier Ford (premier@ontario.ca) to cancel the project because it’s absolutely the right thing to do. 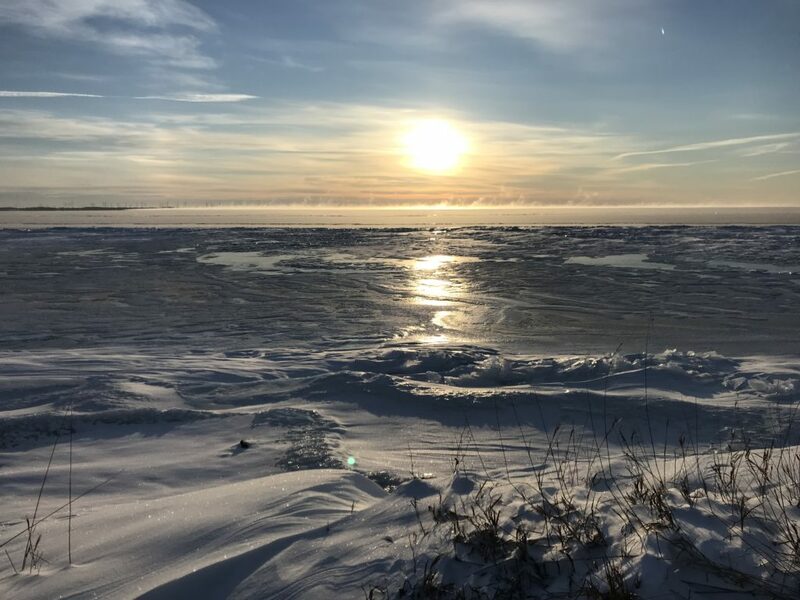 APAI commends Project Snowstorm for its ongoing research and the exciting placement of transmitters on two Snowy Owls on Amherst Island last week. Thanks to the Project Snowstorm team lead by Dr. Jean-Francoisl Therrien, Senior Research Biologist,Hawk Mountain Sanctuary for outstanding work in icy cold conditions, to Kurt Hennige of the Kingston Field Naturalists for liaising with the team, to Janet Scott for her gracious hospitality, to Bonnie LIvingstone and Janet for scouting owl locations, to Jean Iron of the Ontario Field Ornithologists for connecting everyone, and to the many Islanders who cheered and supported the team. Let’s hope “our” Snowies survive the turbines. Things are really happening in a whirlwind here these days, and we have a lot of news to share. Today, it’s two newly tagged owls on Amherst Island, one of the most famous owl spots in North America. (I also made an attempt to tag an owl in northeast Ohio, but came up short — that’s a story for another day.) Tomorrow we’ll have news of still more newly tagged owls, and a general update on the status of our other tagged birds. Amherst Island sits at the northeast corner of Lake Ontario, and is a name that longtime SNOWstorm enthusiasts will recognize. We’ve had a number of tagged owls winter on or migrate through Amherst, including Baltimore, Flanders and Tibbetts — a testament to the draw this island has on snowy owls, as well as many other raptors. Amherst has for decades been a major winter destination for birders and photographers drawn by 11 species of owls, as well as rough-legged hawks and other northern birds. In December, though, work began on what will eventually be a 26-turbine wind farm on Amherst, a project that has generated a significant amount of local opposition, as well as concern about its impact on birds. While not taking a position on the controversy, we recognized that we have a unique research opportunity on Amherst, which might lend some clarity to the debate over the impact of wind energy on raptors. We already have several years’ worth of movement data from owls on Amherst in the absence of turbines — and a last opportunity this winter to obtain more. Once the wind farm is built, we can then continue the study to see whether the movements and behavior of snowy owls change in the presence of the towering structures — something which, so far as we know, has never been investigated. So earlier this week a four-person SNOWstorm team converged on Amherst with the goal of deploying up to four transmitters there: Jean-François (J.F.) Therrien from Hawk Mountain Sanctuary in Pennsylvania; longtime snowy owl researcher Tom McDonald from Rochester, NY; Dave Okines from the Prince Edward Point Bird Observatory in southern Ontario; and McGill University Ph.D. student Rebecca McCabe, who (as we’ll detail in an upcoming post) will be analyzing SNOWstorm’s immense dataset for her doctorate. teams to start trapping. For the next few days, whenever island residents would pass, they’d give the SNOWstorm folks big waves and smiles. “Everybody was incredibly friendly,” J.F. said. That first day (Monday, Jan. 15), though, the team kept coming up dry despite all their efforts — until their luck changed at dusk. Both teams, trapping separately, caught large juvenile females as darkness fell, and just a short time apart. They took the birds back to Janet’s kitchen, where they were processed and tagged out of the cold, then released back at their capture sites. The new birds are Stella and Emerald, named for the two small communities on the island. Both were big, very healthy owls — Emerald weighed 2,135g (about 4.7 pounds) and Stella was 2,379g (5.25 pounds). Since their release, Emerald has been hunting farmland in the eastern half of the island, while Stella has been moving between the base of Long Point at the southern shore and out to the ice up to 3.75 km (2.3 miles) offshore. We want to extend our sincere thanks to Janet and everyone else on Amherst who was so welcoming and cooperative, to our colleagues at Kingston Field Naturalists for their assistance in the planning phase of this project, and to federal and provincial officials for facilitating the necessary permits.